Wednesday was an eventful day in parliament as Opposition Leader Shehbaz Sharif was brought to attend the assembly. He is under NAB’s custody for his alleged role in the Ashiana Housing Scheme scandal. As the vehicle carrying Shehbaz arrived, the PML-N MNAs and leaders surrounded it. 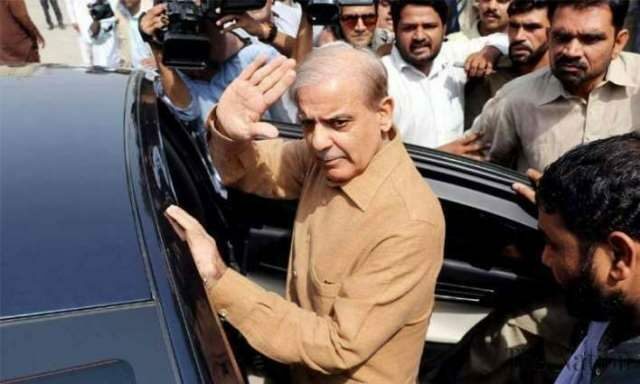 Dressed in Safari suit, Shehbaz looked confident as he stepped out. The NAB team handed him over to parliament security, who took him inside the assembly. On the assembly’s floor, Shehbaz vented out all that he was holding back and made a fiery speech. Bashing the “unholy alliance” between the PTI and NAB, the leader of the opposition said that NAB told him the charges against him weren’t of corruption, but for he awarding contracts to former chief of army staff General Ashfaq Parvez Kayani’s brother in an effort to appease him. “I told NAB that if I wanted to please General Kayani, I wouldn’t have cancelled a Rs40 billion contract awarded to his brother,” he remarked. He went on to say that NAB made some serious allegations, claiming it had evidence, about family’s investments in Turkey and China. “I hit the roof,” said Shehbaz, adding that he told them to present their evidence. Shehbaz said that Prime Minister Imran Khan had made the same allegations, and now NAB is parroting it. A blind person could see what’s happening, he urged. After Shehbaz, former opposition leader and PPP MNA Khursheed Shah’s took the floor. He praised National Assembly Speaker Asad Qaiser for forcing Fawad Chaudhry, the information minister, to cut his speech and give the mic to Shah. But that’s the only positive thing Shah had to say about the PTI government. Shah, sarcastically, said that the only success of the PTI government is making the helicopter fare as cheap as Rs55 per km. “This is a huge change. We should appreciate this,” he continued. The PPP leader criticised the government for seeking a bailout from the International Monetary Fund. In an apparent reference to Prime Minister Imran Khan’s statement, in which he said that he will commit suicide rather than going to the IMF, Shah said: “these are just political slogans.” Maybe he had to seek the bailout for the country’s sake. “Taking a U-turn is not a problem or against the law,” he added. Referring to the information minister, Shah said that there are people in the assembly who used to be our spokesperson and now they a part of the government. Addressing the speaker, Shah said: “You’re an ideological worker of the PTI Mr Speaker, I’ll ask you how much it hurts the day they will leave you.” He said that institutions in Pakistan like to encroach upon one another. It would be better if all the institutions work within their domain and let the parliament work on its own, he added. When the information minister finally got the mic, he didn’t a miss a chance to criticise the opposition. He said that this is happening for the time in country’s history that a suspect on remand has been brought to attend a parliamentary session. Chaudhry said that the assembly session, which was called on the opposition’s insistence, cost around Rs100 million to the exchequer. Refuting that the PTI had anything to do with the cases against the opposition, the minister said that the PTI has not hired a single peon in the existing NAB setup. The current NAB chairman was appointed by the PML-N government with PPP’s consent, he added.